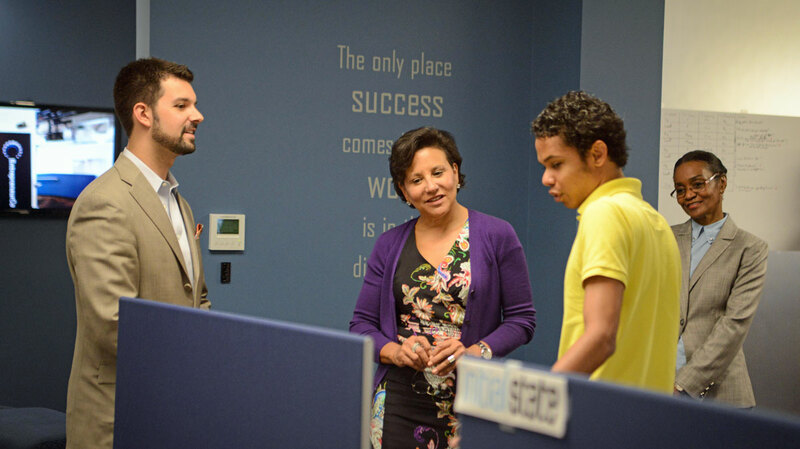 Today, Secretary Penny Pritzker continued her successful nationwide listening tour with a stop at the Entrepreneur Center in Nashville, Tenn. This was her first stop in “Music City, USA” and provided her with an opportunity to hear how the center supports business start-ups and job growth. The Entrepreneur Center (EC), a nonprofit business incubator, helps connect entrepreneurs with investors, mentors and resources that are crucial to accelerating the launch of their startup businesses. The EC houses 80 startups and was created through a public-private initiative, the Nashville Chamber of Commerce’s Partnership 2010, in 2007. Following a catastrophic flood in May 2010, the Commerce Department’s Economic Development Administration (EDA) invested $2.5 million in the EC in 2011 to renovate an historic building, the Trolley Barn, which tripled the facility’s capacity. The investment is also helping mitigate economic impacts of future disasters and helping build a stronger, more disaster-resilient economy.